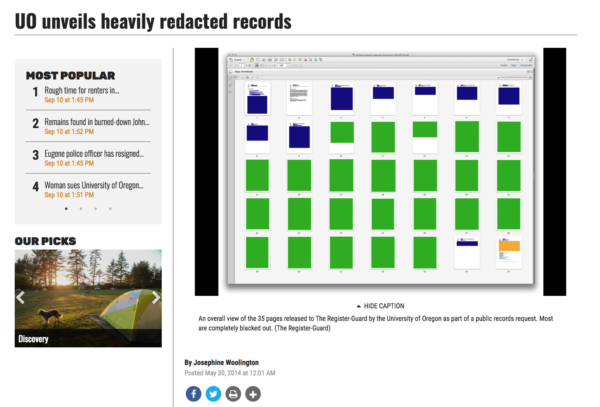 Under Kevin Reed, they’re now redacting the requests too. On Friday I submitted two requests: one for three recent contract proposals, the other for a copy of the resolution of a recent investigation of UO by Betsy DeVos’s Office of Civil Rights. Plenty of public interest there! I ask for a fee waiver on the basis of public interest. I’m ccing Interim Director Greg Shabram, as he should have these documents readily at hand. A request for a fee-waiver is a secret? 1) a copy of any resolution agreements or similar, between OCR and the University of Oregon, from Jan 1 2018 to the present. 2) any correspondence between OCR and the University of Oregon related to OCR investigations, from Jan 1 2018 to the present. I would appreciate receiving these records as pdfs sent to this email address. I ask for a fee waiver on the basis of public interest. Honest people don’t hide things. Just sayin’.